In 2011, the number of hungry people in the world surpassed one billion for the first time. The majority of these people are largely dependent for their food security upon resource-poor smallholder farmers in developing or emerging economies. These smallholders depend on informal seed systems for 75–90% of their food crop cultivation. Southeast Asia, one of the world’s biodiversity hotspots in the face of rapidly dwindling global genetic diversity, is at the forefront of seed systems issues. This article examines activities undertaken by a collaboration of researchers and local institutions to enhance food security within informal seed systems in Thai and Cambodian rural communities. We employed a two-step model for strengthening food security using a range of participatory activities to first understand and characterize, and secondly strengthen informal seed systems in the target regions. We documented seed pathways, histories, and storage as well as gender roles in each community. Informal seed systems were strengthened through identifying potential species for commercialization, addressing technological barriers to seed analysis, and conducting seed fairs and seed banking. These activities not only strengthened informal seed systems, but also significantly enhanced all four pillars of food security in the study communities. 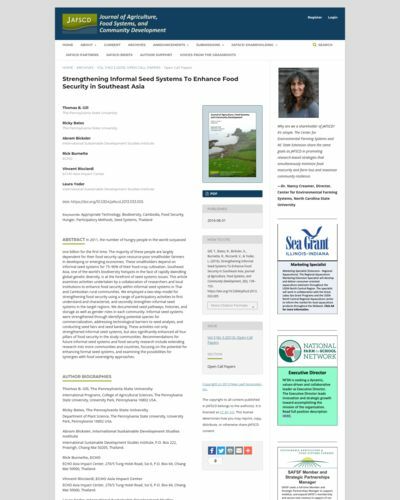 Recommendations for future informal seed systems and food security research include extending research into more communities and countries, focusing on the potential for enhancing formal seed systems, and examining the possibilities for synergies with food sovereignty approaches.